It's been a busy week for church activities. I just finished my much anticipated entry for the Lake Ridge I Ward's Home Video Contest. My only regret is that I wasn't able to get it done in time for consideration by the Academy as the year's best live action short film. I'm hoping to at least sweep the awards at our Ward Activity tonight. During production (which went overschedule--I spent WAY too much time on this! ), it occurred to me that as a consequence of my activity in the LDS church, I commonly find myself doing things I'd never imagine I'd be doing. I've had that thought before, and I had it earlier this week when I was making obscene amounts of beef with broccoli for the Cub Scout Blue & Gold Banquet (Chinese New Year theme--Gung hay fat choy!). A whole lotta beef and a whole lotta broccoli. The same thought occurred to me while I was gathering cotton balls for the Chinese Chopstick Relay. During our planning meeting for the dinner, one of our Cub leaders was struck with the irresistible urge to make something out of Jell-O. Evidently this happens to every Mormon woman at least once in her life, a rite of passage I've yet to experience. She showed up at the banquet with an impressive likeness of the Chinese flag made entirely out of--you guessed it--Jell-O. It was awesome (in the literal meaning of that word)--you have to love being a Mormon! With all the time and energy required, I sometimes wonder about the fruit of my efforts. I got a nice email this week that reminded me why I do all this. 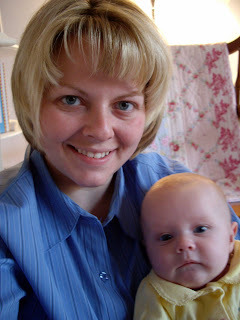 "I thought you would like to know, we were reading our scriptures the other day, in Mosiah. When we got to Mosiah 2:17 my children, spoke up and said, remember M 2:17. This one is about service. And then quoted it without even looking in the book. So my kids remembered your lesson in church. Thought you would like to know. Thanks for working so hard." They offered to release me from Primary when I had Tess. It would be a lot less work, but I would really miss being in Primary. I love the kids in our Primary--they've been my kids when I couldn't have my own. So they're worth it. Tess and I decided to go make-up free today, so you'll have to pardon the bare-faced pictures. My Primary presidency meeting was canceled, so what's the point? Tess thinks I'm lovely the way I am. Tess clearly pulls off the "au naturale" look best, however. No, Laura, I didn't even put mascara on her! We still love you Ry! As far as boys go, you're not so bad. 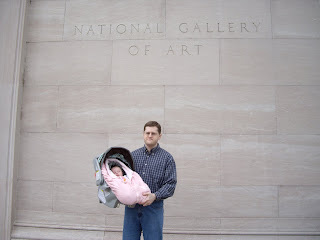 We took Tess on her first DC outing today to the National Gallery of Art. 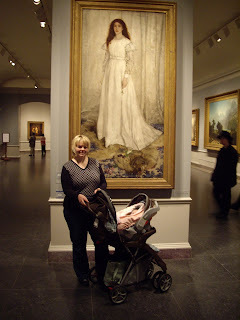 We were excited to show it to her because its one of our favorite places to visit---definitely one of the best museums in DC. 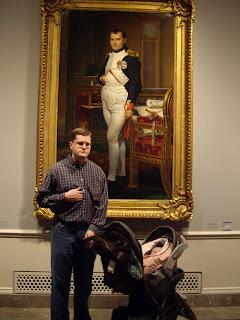 We went to see an exhibit on Baroque Woodcut that Ry's been itching to see for a while. Absolutely amazing stuff--its so hard to fathom that these prints were done in the 1500's. Ry's been interested in woodcuts ever since he tried doing one for a project in high school. Granted, he used linoleum instead of wood and the subject was a little less lofty than those we saw today (a picture of a golfer), but from all reports it turned out pretty well. I've read that black and white patterns are supposed to be visually stimulating for newborns, so I thought Tess would love them, but she pretty much slept the whole time. I may have to attach a few of these to her mobile--do you think they'll give her nightmares? Anyway, I think her first experience was a good one. She at least found the outing relaxing and so did we! We've staying cozy at home today. The weather forecasters predicted an apocalyptic ice storm today and the government was on unscheduled leave, so Ry decided to stay home. The storm didn't live up to the hype, but better to be safe than sorry. Last week we had a big ice storm that shut down all the roads and some people were stranded on the highways for 8 hours. Ry usually takes the bus home, but luckily I caught the news in time to tell Ry to catch the train instead. Ry got an email from the bus company the next morning apologizing to their customers and notifying them that in case of future delays, bus drivers have the discretion to allow customers to get off the bus and urinate by the side of the road if necessary. How comforting. Ry's dad had such a hard time getting home, he pulled off the highway and went to the library for a couple hours until things cleared up. At least they have a bathroom in the library! So Tess got some more dad time in today. She loves being with her dad. Tess been practicing holding her head up and was showing off for him today. Her head is still a bit wobbly, but she's come a long way. Yesterday Tess and I spent a fun day with Nana. We went out to lunch and then had some fun at the mall. We went to a gazillion baby stores and looked at all the fun new stuff for spring. We also did some shopping for a care package that Wendy was putting together for someone in her ward. 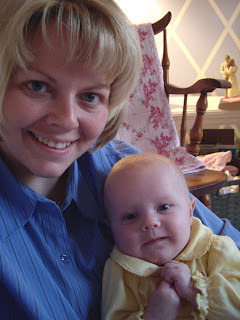 Later that afternoon Wendy had the little neighbor boy over for a bit and we were trying to teach him Tess's name. When we asked him who the baby was, he responded: "Baby Jesus." I don't know why I hadn't considered that name for her. 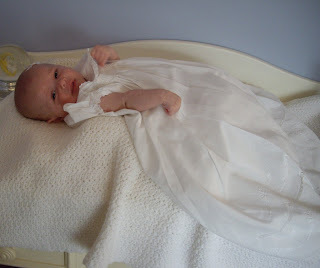 Evidently I'm not the only one who thinks she's a pious-looking baby! Stake Conference Sunday--I'm a big fan! No early morning meetings for Ryan, no Primary for me and only 2 hours of church. Plus, the stake center is our same church, just right up the street. Ry told me that Stake Conference used to be held 4 times a year. Not a bad idea, in my estimation. 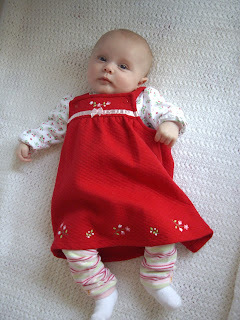 Today Tess wore one of the lovely Sophie Dess sweater dresses from Aunt Laura. Warm, snuggly and pretty too! 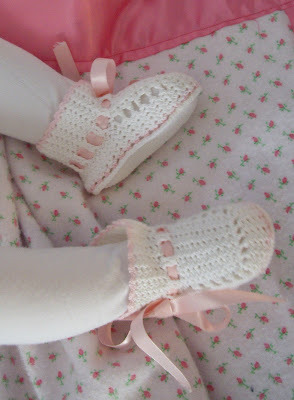 The precious crocheted booties are also from Laura. 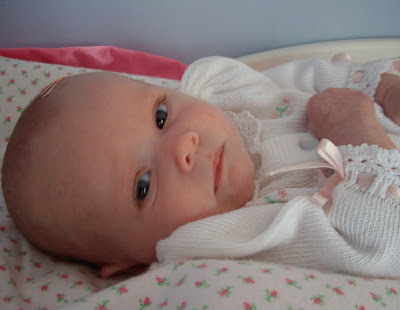 Her matching pink rosebud blanket was made by her Grandma Dipsy. How great to have an excuse to snuggle this sweet little bundle for 2 hours! Baby Tess has been doing so well with her sleeping the past few days! 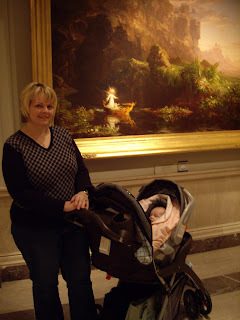 Last night she slept for 8 straight hours--and without the aid of her beloved bouncy chair! When she was sick and refluxy we let her fall asleep in this vibrating bouncy chair, which she loves. Once she got used to that, she wouldn't fall asleep without it. 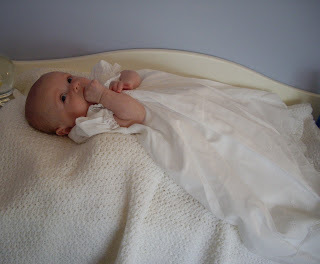 So we'd let her fall asleep at night in it, and then transfer her to her crib once she zonked out. Last night we tried putting her down in her crib and she was able to fall asleep on her own! She was able to fall asleep in her crib for naptime and bedtime today, as well. What a big girl! I've been trying to get her to coo and talk to me, with somewhat limited success. Now I know what my problem was--I've been talking to her in English. 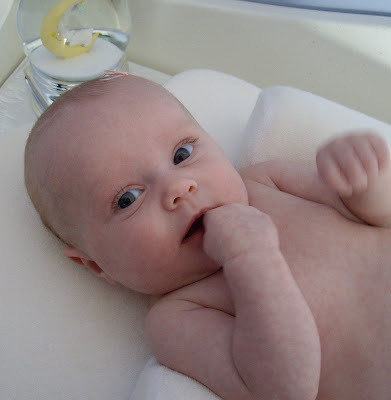 Last night Ryan started talking to her in this bizarre, pidgin-baby language and suddenly she became a little chatterbox! I don't know where Ry learned to speak baby, but he's quite fluent. He won't let me post the video I took (he does sound pretty funny), so here's one of me attempting to converse with her. 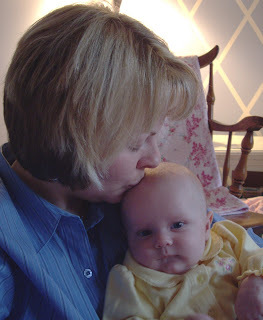 Unfortunately, I'm not any better at speaking baby than I am at speaking French. Hopefully, it won't be too long before she starts to pick up English. I have a dream that one day the black dogs will be able to join paws with the brown dogs and the beige dogs. 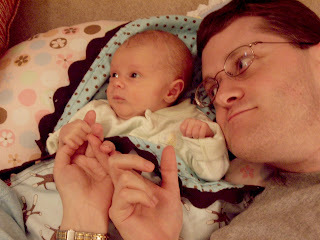 Tess had her 2-month pediatrician's visit today--and she passed with flying colors! Most of you who offered a prediction as to her weight were correct! She now weighs 11 lbs., 3 0z. (55th percentile), is 22 3/4 in. 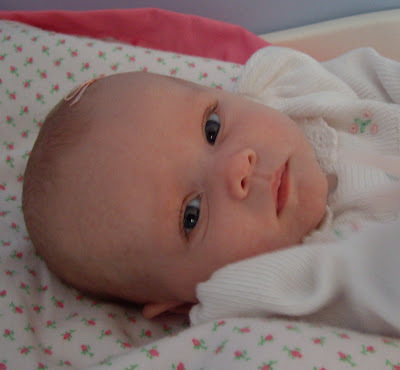 long (60th percentile), and her noggin is 39 cm. around (55th percentile). 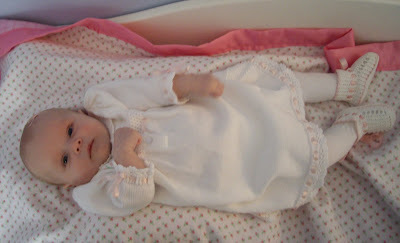 She's a well-proportioned baby and right where she should be with her measurements. She was not a happy camper when it came time for the immunizations. I prepared her this morning by telling her everything that happened today was for her own good. She didn't seem to care. She let out screams that only dogs in the neighborhood could hear! Such high-pitched squeals--I didn't know she was capable of making those kind of noises. I don't blame her, though. Four shots (two in each chunker-thigh), and they don't use baby needles, either! It was so sad--I couldn't bear to watch. I gave her some Tylenol and she's been sleeping it off today. Since she isn't in the mood for pictures, I thought I'd post some pics from when she was small (I know it was only a few weeks ago, but she's changed so much!). 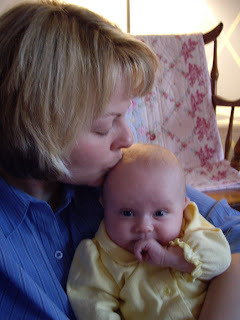 I look back on those days, and I'm glad we're past them (it made me nervous to have her so small and frail), but it makes me sad to see her growing up so fast. If only I could press a pause button and keep her small for a little bit longer. What do you know...on this video you can! The problem I see with this "tagging" stuff is that there doesn't seem to be any kind of safe "home base" where you can hang out and avoid being tagged "it." So I've developed a new rule: a single "tagging" response gives you immunity to all future tags. 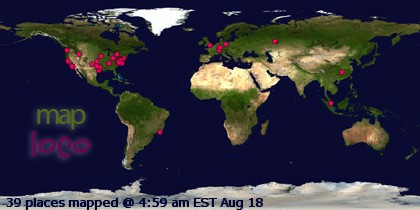 With this post I consider myself officially "safe." And notice, Maureen, that I am not going to continue this madness with vindicative tagging (I'll get my revenge in a better way--you'd better stay on your toes!). HOW OLD IS RYAN: 34...I'm pretty sure. I'm REALLY bad at remembering dates and ages. It took me years before I could remember Ry's birthday with any certainty. I still am a little fuzzy as to our anniversary date (December 29th, I think). HOW OLD AM I: 31...I'm pretty sure. All I know is that Ry's older than me--that's all that matters. WHO EATS MORE: When it comes to Mike & Ike's--definitely Ryan (yuck!). When it comes to everything else--me. WHO SINGS BETTER: Me, though I am the one who messed up our one and only "special musical number" in sacrament meeting. And Ry does sing some dear lullabies for Tess (last night it was "My Shnuggy," to the tune of that "My Buddy" commercial from the 80's). WHO IS SMARTER: Ry--hands down. WHO DOES THE LAUNDRY: When laundry gets done, it's usually me, though Ry does often help me fold the laundry. WHO DOES THE DISHES: Usually me, though Ry helps on the weekends. WHO SLEEPS ON THE RIGHT SIDE OF THE BED: Ry--good ear up. WHO PAYS THE BILLS: He makes the money, I spend it. WHO MOWS THE LAWN: Me--ah, the power of the mighty push-mower! WHO COOKS DINNER: When dinner is cooked, it's usually me. But Ry is very understanding when I ask, "I guess you probably want dinner tonight, huh?" He's usually content with a bowl of Life cereal. However, Ry does make a mean pancake (a trait he inherited from his Dad). WHO IS MORE STUBBORN: I'd probably say Ryan on this one. WHO ASKED WHOM OUT FIRST: Ry asked me out--though it did take an excruciating amount of patience on my part. He called me up on a Friday evening and we talked on the phone for over an hour before his cordless phone totally ran out of battery power. So, he hung up and let it charge for a minute before he called back and we talked for all of 3 minutes before it died again. So, he let it charge again and called back and then it died. I just wanted to see how many times he was going to do this until he finally asked me out so we could talk without a phone dying every couple minutes. The answer is many, many times. But, he finally did and the rest, they say, is history. WHO KISSED WHOM FIRST: I kissed him...a girl can only be so patient! WHO SAID "I LOVE YOU" FIRST: Ry says that I did, and it's likely true, though I don't really remember. WHO PROPOSED: Ry did, though with some gentle encouragement. WHO HAS MORE SIBLINGS: I have 3, Ry has 2.
WHO WEARS THE PANTS: Ryan is definitely HOTH ("head of the household")--that will make him mad! In other news, Tess is officially two months old today! We don't have anything special planned for Valentine's Day today (in fact, Ry is supposed to go on splits with the missionaries--how romantic!). 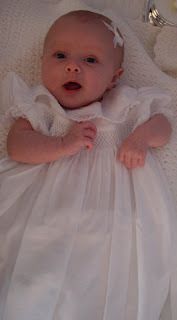 Still, it's our best Valentine's Day ever since we have our own little cherub! What a sweet and special day it has been for us! Today at church Ryan gave Tess her baby blessing. Ryan's dad, our home teachers, a family friend assisted in the blessing. 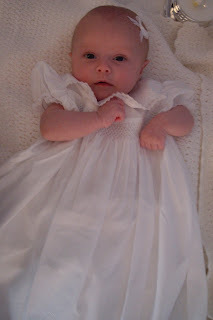 She looked so dear in a precious white blessing gown from her Nana. Ryan's blessing for Tess was absolutely beautiful; it was full of all the wonderful hopes and dreams we have for her that she so entirely deserves. It was special to have Ryan's parents and his sister Laura (and the Fuzz) there for the blessing. Tess was very well behaved; she didn't let out a single squeal. We had a small celebration after church in Tess's honor (though she didn't get to enjoy the cake!). It's a day we'll always remember! Tess & Her Cuz "The Fuzz"
Lights, Camera, Not a Lot of Action!